Follow Interstate 84 East to exit 68 (Rt. 195). From the exit, turn right onto Rt. 195 (follow signs for UCONN). Continue along Rt. 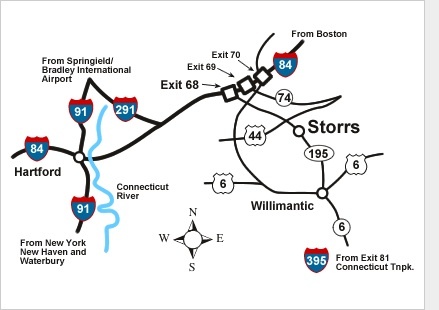 195 into Storrs. Drive past Mirror Lake; turn right into the main entrance of campus (Mansfield Road). Bend to the right at the first fork, and turn left onto Whitney Road. Continue to the second building on your right – this is the Psychology Building, called “Bousfield.” Park in the small unmarked lot immediately behind the building; use the spots labeled “PSC Parking” and call 860-486-0195 when you arrive. 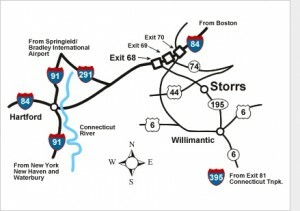 Follow route 195 to UCONN. Turn left onto Mansfield Road. Bend to the right at the first fork, and turn left onto Whitney Road. Continue to the second building on your right – this is the Psychology Building, called “Bousfield.” Park in the small unmarked lot immediately behind the building; use the spots labeled “PSC Parking” and call 860-486-0195 when you arrive.